Did you know the world’s energy needs for one year can be covered by the sun generating power for only one minute? In fact, within 24 hours the Sun is able to generate more energy than the entire population would consume in 27 years. Thus, our sun is not only a truly reliable and lasting energy source but also a very cost-effective and efficient one, if the chosen types of solar panels and the environment are perfectly matched to one another. Such promising prospects have grown in an industry that has put a lot of effort into developing efficient techniques to generate, use, and store the sun’s energy by using different types of solar panels and converting the sunlight into valuable electricity. 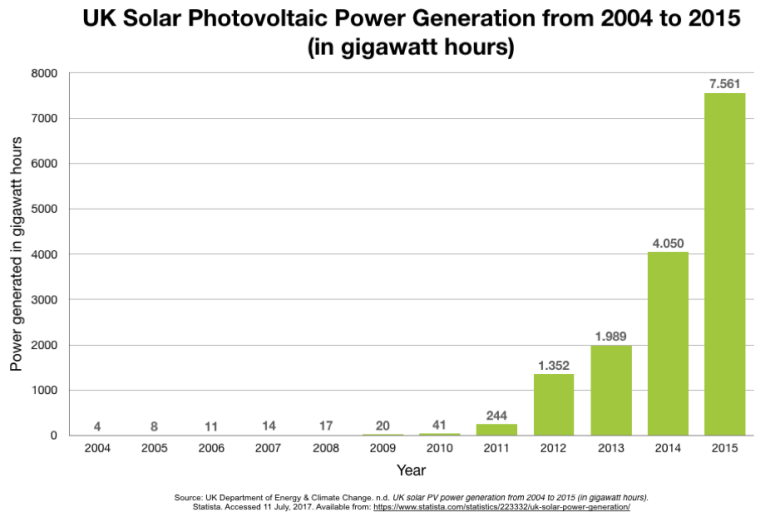 When looking at the graph below, it becomes easy to see the rapid increase in solar photovoltaic power generation that has taken place during the last couple of years in the United Kingdom. Within one year (2014-2015) solar PV power generation increased by almost 87%. Only few people are aware of the different technologies that exist on the market for solar energy such as solar thermal and solar water heating. Whereas these alternatives to the classical types of solar panels are mainly used for heating water, the following paragraphs give a more detailed introduction to the different types of solar panels that are used for generating green electricity. Several decades of research, work, and development have lead to the wide range of different types of solar panels now available on the market for solar panels. To give a broader overview, GreenMatch has put together some helpful information about the most common and special types of solar panels. Different types of solar panels serve different needs and purposes. For a quick and general overview, check out our ultimate solar-panel guide, for a detailed description about the different types of solar panels, keep reading. Given that sunlight can be used differently whether on Earth or in space points to the fact that location, itself, is a significant factor when it comes to choosing one of the types of solar panels over another. Distinguishing between different types of solar panels often means differentiating between single-junctions and multi-junctions solar panels—or first, second, or third generations. Single-junction and multi-junctions differ in the number of layers on the solar panel that will observe the sunlight, whereas the classification by generation focusses on the materials and efficiency of the different types of solar panels. These are the traditional types of solar panels made of monocrystalline silicon or polysilicon and are most commonly used in conventional surroundings. This type of solar panels (made of monocrystalline silicon) is the purest one. You can easily recognise them from the uniform dark look and the rounded edges. The silicon’s high purity causes this type of solar panel has one of the highest efficiency rates, with the newest ones reaching above 20%. Monocrystalline panels have a high power output, occupy less space, and last the longest. Of course, that also means they are the most expensive of the bunch. Another advantage to consider is that they tend to be slightly less affected by high temperatures compared to polycrystalline panels. You can quickly distinguish these panels because this type of solar panels has squares, its angles are not cut, and it has a blue, speckled look. They are made by melting raw silicon, which is a faster and cheaper process than that used for monocrystalline panels. This leads to a lower final price but also lower efficiency (around 15%), lower space efficiency, and a shorter lifespan since they are affected by hot temperatures to a greater degree. However, the differences between mono- and polycrystalline types of solar panels are not so significant and the choice will strongly depend on your specific situation. The first option offers a slightly higher space efficiency at a slightly higher price but power outputs are basically the same. These cells are different types of thin film solar cells and are mainly used for photovoltaic power stations, integrated in buildings or smaller solar power systems. If you are looking for a less expensive option, you might want to look into thin-film. Thin-film solar panels are manufactured by placing one or more films of photovoltaic material (such as silicon, cadmium or copper) onto a substrate. These types of solar panels are the easiest to produce and economies of scale make them cheaper than the alternatives due to less material being needed for its production. They are also flexible—which opens a lot of opportunities for alternative applications—and is less affected by high temperatures. The main issue is that they take up a lot of space, generally making them unsuitable for residential installations. Moreover, they carry the shortest warranties because their lifespan is shorter than the mono- and polycrystalline types of solar panels. However, they can be a good option to choose among the different types of solar panels where a lot of space is available. Have you ever used a solar powered pocket calculator? Yes? Then you have definitely seen these types of solar panels before. The amorphous silicon solar cell is among the different types of solar panels, the one that is used mainly in such pocket calculators. This type of solar panel uses a triple layered technology, which is the best of the thin film variety. Just to give a brief impression of what “thin” means, in this case, we’re talking about a thickness of 1 micrometre (one millionth of a metre). With only 7% efficiency rate, these cells are less effective than crystalline silicon ones—that have an efficiency rate of circa 18%—but the advantage is the fact that the A-Si-Cells are relatively low in cost. 3rd generation solar panels include a variety of thin film technologies but most of them are still in the research or development phase. Some of them generate electricity by using organic materials, others use inorganic substances (CdTe for instance). The Biohybrid solar cell is one of the types of solar panels, that is still in the research phase. It has been discovered by an expert team at Vanderbilt University. The idea behind the new technology is to take advantage of the photosystem 1 and thus emulate the natural process of photosynthesis. In case you want to learn more about how the biohybrid solar cell works in detail, read more about it in the American Journal of Optics and Photonics. It explains more detailed how these cells work. Many of the materials being used in this cell are similar to the traditional methods, but only by combining the multiple layers of photosystem 1, the conversion from chemical to electrical energy becomes much more effective (up to 1000 times more efficient than 1st generation types of solar panels). Among the collection of different types of solar panels, this photovoltaic technique uses Cadmium Telluride, which enables the production of solar cells at relatively low cost and thus a shorter payback time (less than a year). Of all solar energy technologies, this is the one requiring the least amount of water for production. Keeping the short energy payback time in mind, CdTe solar cells will keep your carbon footprint as low as possible. The only disadvantage of using Cadmium Telluride is its characteristic of being toxic, if ingested or inhaled. In Europe especially, this is one of the greatest barriers to overcome, as many people are very concerned about using the technology behind this type of solar panel. Concentrated PV cells generate electrical energy just as conventional photovoltaic systems do. Those multi-junction types of solar panels have an efficiency rate up to 41%, which, among all photovoltaic systems, is the highest so far. The name of such CVP cells is related to what makes them so efficient, compared to other types of solar panels: curved mirror surfaces, lenses and sometimes even cooling systems are used to bundle the sun rays and thus increase their efficiency. By this means, CVP cells have become one of the most efficient types of solar panels, with a high performance and efficiency rate of up to 41%. What remains is the fact, that such CVP solar panels can only be as efficient if they face the sun in a perfect angle. In order to reach such high efficiency rates, a solar tracker inside the solar panel is responsible for following the sun.